One of the most common problems many Fjord owners have is finding a bridle that fits. Fjords have unique heads, and Ypke is no exception to that — she requires a full browband, cob cheek pieces, oversize noseband, and pony reins. Ypke originally had two dressage bridles, a cob and a full — the cob was always a nightmare trying to get the noseband to even buckle at the first hole, yet the full was waaaaaay too big in the cheek pieces. One bridle had brass hardware, and the other stainless steel... this made interchanging them rather ugly. That is where Flexible Fit Equestrian stepped in and kindly sent me their Mix and Match Bridle, which allows you to choose each individual part in the desired size. 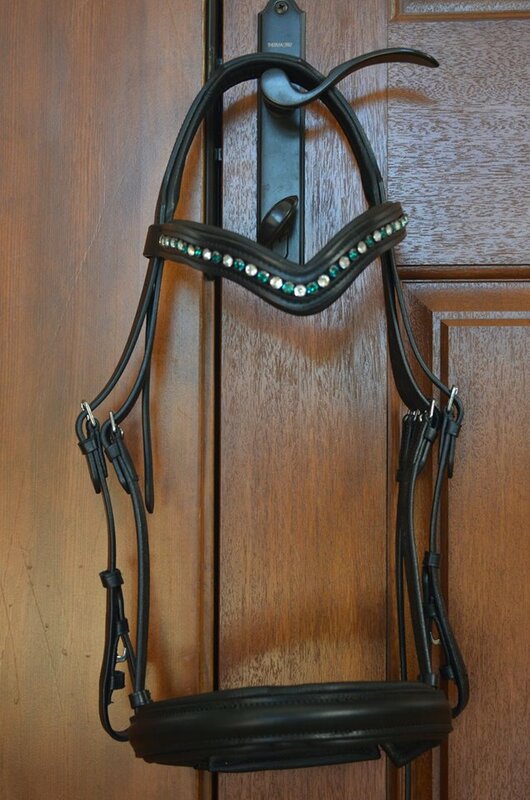 On top of that, there are many different options of nosebands, browbands, and reins that you can choose from! One of the features that I liked the most about this bridle was the monocrown headpiece. I have only had bridles where the noseband was a completely different attachment/overhead strap, making adjustment difficult. It is also nice to not have the extra bulkiness of one more strap going over the poll. This monocrown in particular has cutback ears which, in theory, should relieve pressure. This feature is also particularly useful while taking the bridle on and off — it easily slides right over her ears! The crown's cutback for the ears. Going along with the monocrown, I found it very handy that everything, including the throatlatch, is double buckled. This feature made adjusting the fit a breeze, so I suppose the name Flexible Fit is, well, fitting. Since the noseband didn't go over the poll and buckled on each side of her head, this allowed for easily getting just the right ideal placement (having those buckles also made it so easy to make the noseband level... none of that bothersome crookedness!). I personally don't see the need to use a flash on Ypke, so I was glad to see that the attachment is removable. As long as you are semi-dexterous, you can take that puppy on and off in under 5 seconds. Upon being removed, the padding magically forms back up to the rest of the noseband. You can't even tell that there was ever a flash attachment there, unlike those nosebands with the permanent piece that just sits pointlessly if there isn't a flash through it. This work of art even sparkles indoors. In the sunlight, it temporarily blinds you. Padding: The padding is, quite simply, fantabulous. The Flexi-Fit Gel is soft and squishy, and I am sure that it provides a great deal of comfort for the areas that come in contact with the monocrown, browband, noseband, and chinstrap. You can even stick the bridle into the refrigerator to cool the gel. This supposedly helps to regulate the temperature of pressure points, but since I have not tried out that nifty sounding feature, I can't comment on it. I also found out that they make Flexi-Fit Gel girths — I would be curious to see how much that would help (especially in this 110* weather). Hardware: This was the one area of the bridle that I feel could use improvement. Compared to the rest of the nice craftsmanship of this headstall, I found the buckles and hooks to be a tad flimsy, though I don't find them to be a cause for concern as far as the structural integrity goes. They are by no means poor quality though. I honestly do not think you can beat the customer service that Flexible Fit provides. On top of their prompt, polite reps, they really did strive to make things work for me. Upon arranging for this review, I measured Ypke several times and finally sent them off on May 3. The company is located in Australia, and I am located in a rural area of the Pacific Northwest. 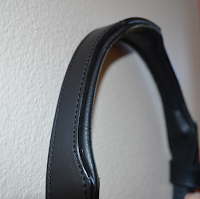 The bridle arrived May 15 — that is faster shipping than some of the places in the PNW that I have ordered from! Upon receiving it, I was absolutely mortified to find out that the noseband was too small (I blame it on my non-dexterous hands fumbling with the measuring tape). I tried everything I could to make something work, but finally, after two long days, I fessed up. Now, I figured that they would say, "We hate your rotten guts, you filthy scammer." But in reality they promptly replied with, "Oh, no problem, we'll send a new one your way." I still feel really guilty that I ended up with two nosebands, but they truly made this by far the best experience that I have ever had with customer service. Shout out to you, Sheree! All in all, I am very pleased with their product. It is now my favorite bridle in the tack room! Sounds like a really nice bridle with some innovative features! I will have to check out their website. Yes, I am quite pleased with it! Pretty! Neat features, I like the idea of the removable flash. Very cool website! Thank you for sharing. Wow, that looks like a really nice bridle! Do you have the same problem with halters? I've been looking for a new halter for my horse and can't seem to find one that fits well. I've never had issues with finding a halter that fits her. Her rope halter is easy to work with, and her leather halter can be adjusted on the noseband and both sides of the crown. Jethro, on the other hand, needs halters custom made for donkeys. Now those are hard to find!